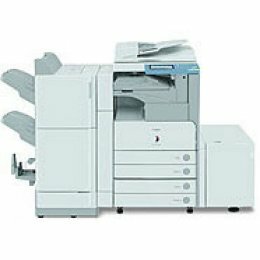 The color-enabled Canon Color imageRUNNER C5800 Copier is designed to support the high volume applications of busy corporate environments offering renowned black and white quality and the ability to support occasional color requirements. The Canon IRC5800 Copier operates at 58 pages per minute (ppm) for black and white output and 16 ppm for full color output. It boasts exceptionally fast scanning at speeds of up to 70 ppm (at 300 dpi) and 50 ppm (at 600 dpi). The Canon Color imageRUNNER C5800 Copier offers digital copying, mailbox features and Ethernet connectivity as part of its standard feature set. Optional features include a choice of: Canon's Color Network Multi-PDL Printer Kit-C1 or the imagePASS-D1 for value-added network printing capabilities; Color Universal Send Kit-C1P for increased sending capabilities; Canon's Color Network ScanGear utility for TWAIN-scanning capabilities; and Super G3 Fax ii & iii capabilities. The Canon Color IRC5800 Copier has versatile document handling and finishing capabilities to make businesses stand out above the rest. With digital enabled features such as Scan-Once-Print-Many and Job Build, the Canon Color imageRUNNER C5800 Copier makes quick work of scanning large volumes of hard copy originals. A standard 4,200-sheet capacity can easily be upgraded to support a voluminous 7,700-sheet feeder through a maximum of 6 paper sources. Moreover, the system can accommodate tab paper, stocks as large as 13"x 19" and paperweights up to 140lb. Index. From simple collating and stapling, to advanced saddle-stitched booklets and two or three hole punching, the Canon Color imageRUNNER C5800 Copier automates every step of the document finishing process - providing users with the ability to produce professional looking documents easily and in-house.